Spartanics Stand #9G38 at the 2013 Labelexpo Europe Show in Brussels. 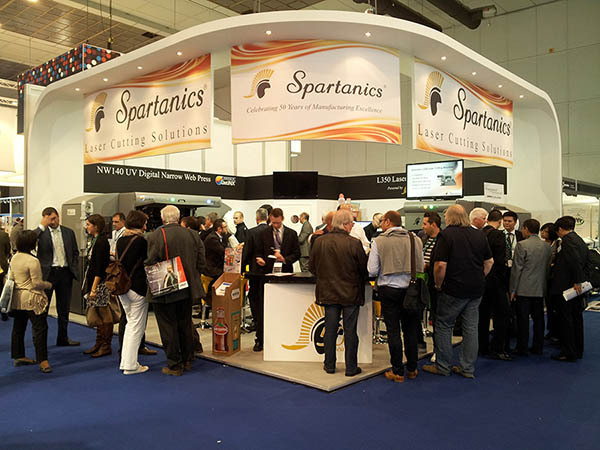 ROLLING MEADOWS, ILL., USA – October 7, 2013 – Laser cutting machine manufacturer, Spartanics, created a buzz in the digital finishing area at the 2013 Labelexpo Europe show in Brussels by unveiling their latest additions to laser cutting solutions for the label and packaging industries. With Labelexpo reporting record-breaking attendance figures, nearly 32,000 visitors from all over the world were able to discover the latest trends in manufacturing technology for the label and packaging sectors. The Spartanics presence was particularly impressive as the company celebrated their 50th anniversary. Spartanics’ stand seemed to be the primary laser cutting solution hub during the show period with guests and reps from all over the world coming to see live demonstrations of the Spartanics L-350 Laser Cutting Machine and the NW140 UV Digital Narrow Web Press. The Spartanics L-350 is a 400 watt, single source laser system with a 350mm wide scan head design and an abundance of converting options for today’s label converter. The NW140 UV Digital Narrow Web Press is a 140mm all-in-one uv inkjet solution with plate-less digital printing and in-line Spartanics laser finishing. Spartanics technology was also featured in the Durst booth as both companies teamed up to integrate their sophisticated technology in the Durst Tau 330 UV Inkjet digital label press. The Durst Tau 330 is a high speed 330mm wide Inkjet printer designed for short and medium job runs that is capable of print resolutions of 1,000+ DPI and speeds of up to 157 linear feet per minute with production capacity of up to 10,220 square feet per hour. The 2013 Labelexpo Europe show has proven to be a great success for all companies involved. Spartanics qualified over 200 leads during the short 4 day period! The company is currently planning for the 2014 Labelexpo Americas show in Chicago. For all sales and product inquiries please contact Mike Bacon, VP of Sales and Marketing at Spartanics, (847) 394 5700, FAX (847) 394 0409, Email: sales@spartanics.com.